Instagram has secretly launched new filters for your posts. I didn’t receive any notification in my app. I saw a few new filters when I was posting a photo. So, guess what? We’re going to write a tutorial on achieving those filters in Photoshop. Today, we’re going to learn how to create Instagram Aden filter in Photoshop. Achieving Instagram effects are very easy in Photoshop. You don’t need to use any brush. Just a few adjustment layers will do the job. I am also going to use just a few adjustment layers to achieve Instagram Aden filter in Photoshop. These will be basics like Brightness, Photoshop Filter, Hue and Saturation, and Gradient Map. Before I proceed with the tutorial, let me show you the before and after photos. I analyzed that the Instagram Aden filter adds greenish tint to the dark areas and bluish red tint in the light areas. Overall, it also reduces the contrast and decreases the brightness by a few points. Let’s do the same. Go to Layer > New Adjustment Layer > Photo Filter. Change the Filter to “Green” and increase the Density to 57%. Make sure that “Preserve Luminosity” is turned on. This will add a green tint to the image. Again, we’re going to add a tint with the Photo Filter. Go to Layer > New Adjustment Layers > Photo Filter. Choose “Cooling Filter (82)” this time, and increase the Density to 8%. Make sure that “Preserve Luminosity” is turned on. This will add a faded blue tint to the image. Time to add green tint to the dark areas and red tint to the light areas. Go to Layer > New Adjustment Layer > Gradient Map. A panel will open. Click anywhere inside the box where a gradient is present. You can refer the below screenshot. There’s a chance that you’re seeing a different than Black and White. It doesn’t matter. Click on the box. Click on the Red to Green gradient. Now, the red color is present at the left which means that the dark areas of the photo will be colored with the red. Similarly, bright areas will be colored with the green. Press OK.
Click on “Reverse”. This will reverse the gradient. Now, dark areas will be colored with green and bright areas will be colored with red. Change the Blend Mode to Color Dodge. Decrease the opacity to 49%. Press F7 to open the layer panel if it’s not opened. This is how your photo will look. The photo is quite bright. You can see that the sky a bit overexposed than the Instagram Aden Filter standard. We’re going to tone it down. Go to Layer > New Adjustment Layer > Levels. Drag the slider that is highlighted in the below screenshot towards left. I am going to stop at the point where the reading is 244. The change would be very subtle. Here’s the image. Almost all Instagram filter decreases the contrast. Instagram Aden filter also does. Go to Layer > New Adjustment Layer > Brightness and Contrast. 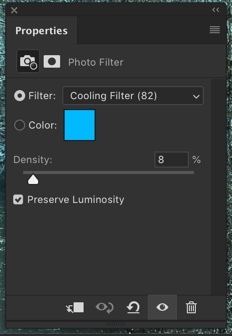 Decrease the contrast to -39 and increase the brightness to 9. Your photo should look like this. Here’s the last step. Time to give a blue tint to the photo. Go to Layers > New Adjustment Layer > Hue and Saturation. Click on the “Colorize”. Increase the Hue to 241 and increase the saturation to 30. Decrease the opacity in the layer panel to 14%. Press F7 to open the layer panel if it’s not opened. Your photo will look like this. If you’re interested in the Photoshop action for the Instagram Aden filter, download it from the below link. Here’s the final photo again for you.